The New England Interstate Water Pollution Control Commission’s roots stretch back to the post-World War II era. Then, an industrial and population boom was in full swing and pollutants often flowed unchecked into lakes, rivers, and bays. Congress recognized the need for states to cooperate in the fight against this growing threat. In 1947 Congress passed legislation allowing for the formation of interstate water pollution control commissions. 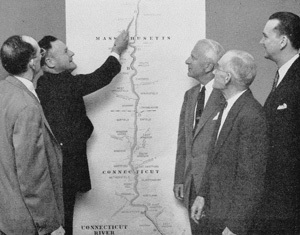 1954: NEIWPCC Commissioners discuss the proposed classification for the Connecticut River at a public meeting in Springfield, Massachusetts. Connecticut, Rhode Island, and Massachusetts responded immediately by forming NEIWPCC. Vermont, Maine, New Hampshire, and New York State joined the Commission shortly thereafter. The member states endowed NEIWPCC with responsibilities, power, jurisdiction, and financial support. NEIWPCC originally focused on creating water quality standards and classifications for interstate waters in the region. This led naturally to issues surrounding wastewater treatment. Our focus on wastewater continues to this day, but NEIWPCC’s role has grown considerably. In the late 1960s and early 1970s, federal and state legislative changes, coupled with the growing complexity of water quality issues, spurred the Commission to take on a broader role in serving our member states’ interests. In 1969, NEIWPCC created the New England Regional Wastewater Institute (NERWI), a training school for wastewater treatment plant operators. The school was located on the campus of the Southern Maine Vocational Technical Institute in South Portland, Maine. After the passage of the federal Clean Water Act in 1972, NEIWPCC again expanded activities to include public outreach and an even greater emphasis on environmental training and assistance. 1975: Students pose for a graduation photo after completing a nine-month program at NEIWPCC’s New England Regional Wastewater Institute. We also represents the views of our member states about proposed regulatory changes, using written communications and congressional testimony. In 1998, NERWI discontinued operations, but NEIWPCC has maintained a firm commitment to training. Today offer a diverse range of courses at locations throughout our member states. NEIWPCC also manages Maine’s Joint Environmental Training Coordinating Committee. NEIWPCC continues to evolve as we respond to ever-changing water issues. Over the years, we have tapped the region’s considerable expertise, forged new partnerships, and explored fresh sources of funding. NEIWPCC remains flexible and adaptive so that we can address emerging issues in an efficient, effective manner and remain at the forefront of water management and protection. Ordering the Waters, part of our reprint series, tells how work begun in the 1940s continues to guide today’s efforts for clean water. 50 years of Training Excellence celebrates the first wastewater training courses and what followed. We provide a complete collection of our annual reports online, starting with the first one from 1948.